On July 1st, the school reopened after a long and hot summer. All the teachers met the week before to discuss the future strategy for the school, but also to clean the school after the sandstorm that hit them. Another task the teachers had during the preparation week, was to do another “door-to-door” outreach. They planned it well so that they would reach out to as many villages as possible. The staff travelled to different areas than before and met people who had no idea about the sponsorship program from Glocal Aid. A lot of the families they met seemed very enthusiastic about the program. Some of these kids must travel 25-30 kilometers to get to school. Luckily, the school van has made it a lot safer and easier for the kids to get back and forth from school. It also means that more children that live further away can still have the chance of getting an education. Our number of school buses were recently increased from four to seven due to the increase of children. Both parents and students are so grateful to Glocal Aid and all its partners for also covering the expenses for the school buses. The school and the community see great increase of interest to have more kids be enrolled into the school program. To make the best possible use of the school building, the office workers met with the Headmaster in the preparation week to look at possible renovations. At the moment, the school has had to say no to several students because there isn’t enough space. For now, there’s room for 500 students, and the classes were full long before the semester started. In order to keep the standards at Ebenezer School and follow the increase of students by another 95 to the maximum of 500, new teachers were hired. They went through a long hiring process, to make sure they got the right people for the job. School started again the second week of July and the children all seemed excited to get back to school and to see old and new friends again. In the beginning of the new school year, all the students were given school equipment; a school bag, text books, exercise books and a pencil case with contents. Then they were all given school uniforms, and all the students showed great appreciation for all the equipment. The first few days of school the staff decided that the students and teachers would take a few days to get to know each other, to be comfortable around each other before they started with the syllabus. As a welcoming to the new teachers, the staff arranged a get-together for all the teachers for them to get to know each other more and to welcome the new teachers. They had speeches, presentations, games, dancing and ended it all with lunch together. A new and improved playground area in the school. Good and efficient internet connection. To have more computers for the students to use. There are many things to celebrate in India and August 15th, is one of them. It´s India’s Independence Day, and Ebenezer school participated in the celebration too. After the students had had a few classes, the rain lifted and everyone met outside to raise the flag and a few students gave a speech. Another celebration is “Rahsha Bandhan”. It´s one of many festivals in India, and is a public holiday. Ebenezer school took some time out of the schedule one day in advance to celebrate with everyone at the school. This festival is mainly a celebration for siblings and is viewed as sacred sanity between sisters and brothers. It is also considered a celebration to strengthen the brothers and the sisters ties. Ashok, Ravi and Ajay Kumar Yadavs father works with cattle raring. They live in a small, broken house. The staff from Ebenezer School came to this family´s house last summer. They were told about the sponsorship program, and the parents showed interest and signed all their three sons up, despite the family´s very unstable income. Their father leaves early in the morning with the animals to the hillside, and come back late at night. Therefore, they are forced to sell the milk at the market, for the buyers offer, and for that money they buy whatever groceries they can. The three brothers have just started their second year at Ebenezer School, thanks to all the support through Glocal Aid and its partners. Shaina and Shafique are siblings. Their family is muslim and their father works with chickens. He had help from the local government to finance the start-up of his business. Being the only person in the family with income, it´s been hard to make ends meet with a sick, old father and younger brother to take care of. 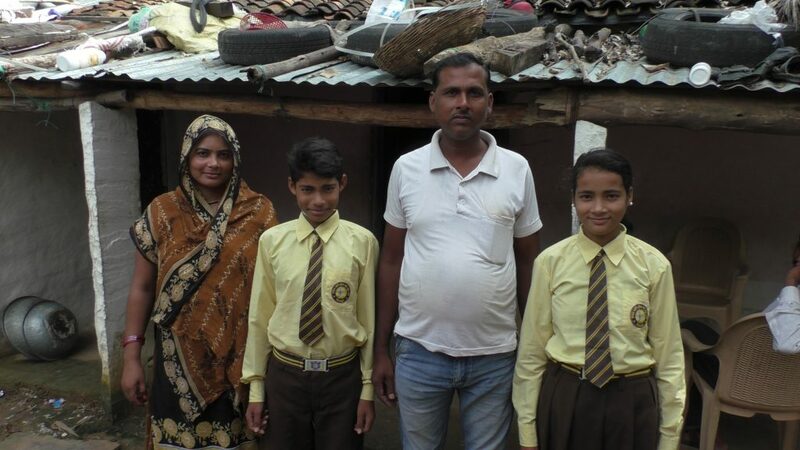 When Shaina and Shafique´s father first heard of the sponsorship program, he was not interested because of it being a Christian school, until he heard about the numerous benefits his children would have from attending. The children have now attended Ebenezer for three months, and there’s is already a noticeable improvement that both the school and their dad sees. This wouldn’t be possible if it wasn’t for Glocal Aid and everyone who is standing with them.